Austrian physician, journalist, and leader of the Austrian labor movement; born at Prague, June 24, 1852. Having been graduated as M. D., he settled in Vienna, where his professional practise brought him in contact with the Vienna poor. Adler began to study their economic conditions, which led him to an examination of the whole social problem. So intense became his interest in this subject, that he gave up his practise and devoted himself entirely to socialism. When he joined the socialistic movement, the working classes of Austria were disorganized and wasted their energies in factional fights and anarchistic plots. 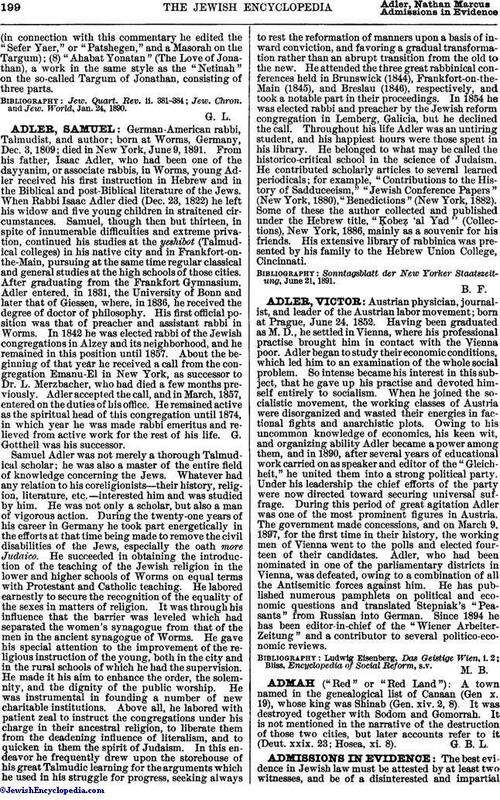 Owing to his uncommon knowledge of economics, his keen wit, and organizing ability Adler became a power among them, and in 1890, after several years of educational work carried on as speaker and editor of the "Gleichheit," he united them into a strong political party. Under his leadership the chief efforts of the party were now directed toward securing universal suffrage. During this period of great agitation Adler was one of the most prominent figures in Austria. The government made concessions, and on March 9, 1897, for the first time in their history, the working men of Vienna went to the polls and elected fourteen of their candidates. Adler, who had been nominated in one of the parliamentary districts in Vienna, was defeated, owing to a combination of all the Antisemitic forces against him. He has published numerous pamphlets on political and economic questions and translated Stepniak's "Peasants" from Russian into German. Since 1894 he has been editor-in-chief of the "Wiener Arbeiter-Zeitung" and a contributor to several politico-economic reviews. Bliss, Encyclopedia of Social Reform, s.v.